而随着sfs的成功,也开始将目标转向了目前新兴的iphone, android, sillverlight, unity等 客户端.这次使用c# client api做了一个winform测试程序,使用起来也是非常的方便. CustomLogin的处理在zone extension里,必须先join room才能使用xt message.所以需要先写一个zone extension,在这里处理登录验证,注意验证成功后需要向客户端发送room list, 客户端必须收到room list消息才能做后面的操作,这是sfs限制死了的. sfs中服务器与客户关通信的协议有三种:xml,json和raw string,使用json会比xml节省不少字节,但其仍然占用比较大的带宽开销.如果是数据交互量比较小的应用,这个问题不会太大,但对于即时战斗类MMO来说,可能会成为一个比较大的问题.尝试了一下使用raw string的方式传递结构体,但是没找到比较好的方法,以后有机会再继续,如果可能的话,结合google proto buffer和raw string方式,将会是一个比较好的方案. Install and open Netbeans. Create a project from existing java source pointing to where your extensions are. Should be placed in src subfolder to be nice. Right click on project and choose properties->libraries. Add all jar files from your smartfox installation lib dir. Goto Files tab. Expand nbbuild.xml. Click on -post-compile target. Choose Run->Build main project (F11) in Netbeans. If build is ok, click the batch file. 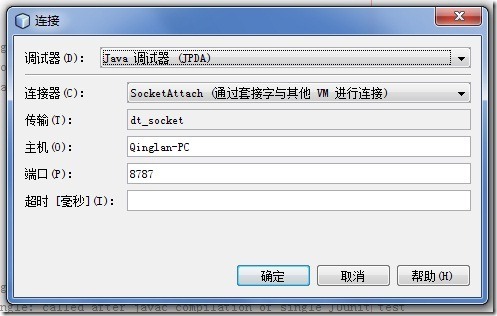 Now select debug->attach debugger and choose port 8888. Debugger console should say "User program running". Now you can place breakpoints and trigger your extensions normally.